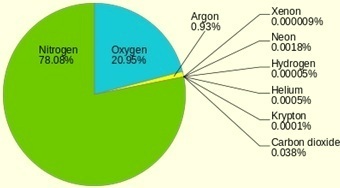 Dry air contains by volume 78.08 % of nitrogen, 20.95 % of oxygen, and 0.93 % of argon along with traces of a number of other gases (Fig 1). Atmospheric air can contain varying amount of water vapor (depending upon humidity) and other gases produced by natural processes and human activities. Non cryogenic air separation processes are near ambient temperature separation processes and are used for the production of nitrogen or oxygen as gases. These processes are cost effective choices when demand of gases are relatively small and when very high purity of the gases is not required. Non cryogenic plants are compact and produce gaseous nitrogen which is typically 95.5 % to 99.5 % oxygen free or gaseous oxygen which is 90 % to 95.5 % pure. Non cryogenic plants are less energy efficient than cryogenic plants (for comparable product purity) but at the same time cost less to build. The physical size of the plant can be reduced as required purity is reduced, and the power required to operate the unit is reduced as well. Non cryogenic plants are relatively quick and easy to start up and can be brought on line in less than half an hour. This is useful when product is not needed full time. Like cryogenic plants, non cryogenic air separation processes also start with compression of air. Unlike cryogenic plants which use the difference between the boiling points of nitrogen and oxygen to separate and purify these products, non cryogenic air separation plants use physical property differences such as molecular structure, size and mass to produce nitrogen and oxygen. Non cryogenic processes are based on either selective adsorption or permutation through membranes. The most common technologies used for non cryogenic air separation plants are given below. Pressure swing adsorption or PSA – This technology is used to produce nitrogen or oxygen using different adsorbents. Vacuum pressure swing adsorption or VPSA – This technology is used to produce oxygen. Membrane separation – This technology is used to produce nitrogen gas. PSA technology is used to produce either nitrogen or oxygen by passing compressed air at several atmospheric pressures through a vessel containing adsorbent materials. Adsorbents are chosen on the basis of their adsorption characteristics. A desirable adsorbent has much greater affinity for non product molecules than for the product gas (nitrogen or oxygen). This characteristic results in most of the molecules of the product gas passing through the bed and into the product stream, while other components of the air are captured by the adsorbent. The PSA process is basically a batch process, as the adsorbent bed needs periodic desorption. Hence PSA plants usually have two adsorbent vessels to provide operational continuity. At any time, one of the vessels is making product by adsorbing undesired components of the air, while the other vessel is undergoing regeneration by depressurization to atmospheric pressure. When the adsorbing vessel approaches saturation, a set of valves quickly switches the streams to other vessel. A surge vessel (buffer vessel) downstream of the absorbers makes sure that delivery of the product gas is continuous. While the two bed system is most common, mono bed or three bed configurations are also sometimes used. The mono bed system provides capital savings while the three bed system provides for greater continuity of production. Oxygen PSA plants usually use alumina to remove the water vapour from the air feed, together with zeolite molecular sieve to adsorb nitrogen, carbon dioxide, residual water vapour and other gases. Typical oxygen PSA delivery pressures leaving the plant are one to three atmospheres. Oxygen purity is normally between 90 to 95%, limited primarily by the argon content, which is usually in the range of 4.5 % to 5 %. Nitrogen PSA vessels contain an activated carbon molecular sieve material which removes oxygen and other undesired components by adsorption. Nitrogen is typically delivered from the production unit at pressures of six to eight atmospheres and at a purity of 95 % to 99.5 %. If a higher purity is needed then both the equipment size and the ratio of air feed to product make go up. Alternatively, a ‘de-oxo’ unit is added which catalytically combines hydrogen with the oxygen in the nitrogen product leaving the PSA, producing water. This water is removed by cooling and additional adsorption. The waste stream from a nitrogen PSA plant is enriched in oxygen – often to around 40 % oxygen. This stream is sometimes used for combustion enhancement or waste treatment equipment operation at the PSA plant. Vacuum-pressure swing adsorption technology is used to produce oxygen with purity ranging from 90 % to 94 %. Impurities are argon and nitrogen. Argon content is usually between 4.5 % and 5 %. Air separation plants using this type of non cryogenic oxygen production process may be referred to as VPSA (vacuum pressure swing adsorption), VSA (vacuum swing adsorption) or PVSA (pressure vacuum swing adsorption) plants. The process cycle is similar to that of PSA plants except that vacuum pumps are used to reduce the desorption pressure. The lower desorption pressure reduces the inlet pressure. Hence a VPSA plant produces oxygen at around 0.2 atmospheres (gauge). When higher oxygen delivery pressures are required, an oxygen booster compressor is added to the plant. Overall, VPSA plants are more costly but more energy efficient than PSA plants for the same product flow, pressure and purity conditions. VPSA plants regenerate the sieve material under vacuum conditions. It results into more fully regenerated molecular sieve material. This sieve material is more selective than material subjected to the regeneration process in a PSA plant. As a result, a higher percentage of available oxygen is recovered which means that less air is to be processed. Air compressor power is greatly reduced compared to a PSA plant because of lower air flow and lower compressor discharge pressure which is usually less than half an atmosphere (gauge). However there is an off-set to the air compression power savings due to power needed to operate the vacuum pump. Overall, VPSA plants are more costly but more energy efficient than PSA plants for the same product flow, pressure and purity conditions. VPSA units are normally more cost effective than PSA units when the desired production rate is more than 20 tons per day. They are usually the most cost-effective oxygen production choice up to 60 tons per day provided high purity oxygen is not required. Above 60 tons per day, cryogenic plants are usually the oxygen production technology of choice, although in some cases, two VPSA plants allow for better matching of large step-changes in demand. Membrane separation technology uses tube bundles made of special polymers, often configured in a manner similar to a shell and tube heat exchanger. The air separation principle is that different gases have different permeation rates through the polymer film. Oxygen along with water vapour and carbon dioxide are considered ‘fast gases’ that diffuse more rapidly through the tube walls than the ‘slow gases’ argon and nitrogen. This allows dry air to be converted to a product that is an inert mix of mostly nitrogen gas and argon, and a low pressure ‘permeate’ or waste gas that is rich in oxygen, water vapour and carbon dioxide that is vented from the shell. Nitrogen product emerges from membrane units at close to the compressed air feed pressure. Since there are no moving parts in the separation process, membrane units can be rapidly activated when needed and shut down when they are not. Membrane separation plants are usually made in standard size modules with nitrogen production ratings that depend upon the desired nitrogen purity. For a given standard module nitrogen production rate increases with higher inlet air flow rates but at the same time the purity of nitrogen decreases. When the needed production capacity (at a specified purity level) is more than the largest standard module size, a number of smaller units are usually combined in a manifold to allow them to operate in parallel. Membrane plants are cost effective for relatively low demand applications. Since larger capacity plants are usually made up of multiple smaller capacity modules, membrane plants have a close to constant cost per plant of production capacity over a wide range of production rates. This is in contrast to the declining cost for marginal capacity that is typical with PSA nitrogen plants and cryogenic air separation nitrogen plants.